"Bistro Taiyo" was established as a Japanese Restaurant in Nanaimo,Canada. In Japanese, "taiyo" means "sun". The name was decided on because it reflects our desire to be a useful existence for people everywhere and bring light to the world like the sun, which gives its blessings to all life on earth. 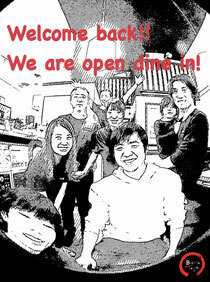 We would like to provide all customer with real Japanese foods and smile!! Thank you for all customer! We will be closed November 12th on Monday for Remembrance Day. We will be open November 13th on Tuesday as usual. We have some Party Tray, come to get it and let's have a sushi party!